The first thing that anyone will notice when they come to the Bay of Islands is the exceptional beauty of the place. The interior of the islands are green with 90 mile beach skirting the western side of the North Island. 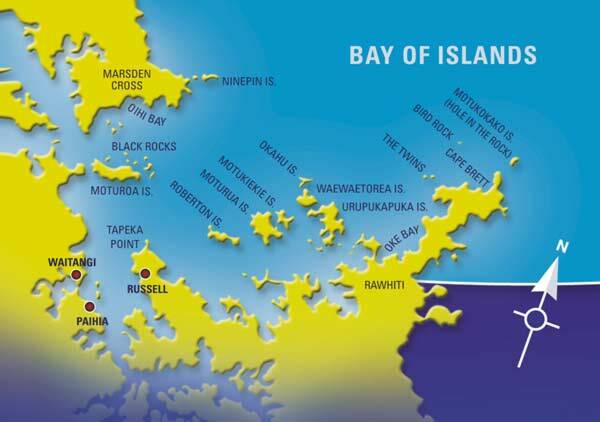 The Bay of Islands is situated at the far north end. The glass-like waters reflect the milky white clouds to give photographers an impressive image to capture. The bay is so called because it has almost one hundred and fifty islands dotted around. Named by the famous Captain Cook in 1769, this is probably the most historic place in all of New Zealand. The town of Russell (Kororareka) was already an established settlement of the Māori people who sailed in from Polynesia around a thousand years ago and, eventually, the whalers and seal catchers who followed after that. Missionaries were not far behind and it became the first European settlement in New Zealand. It was here that the Treaty of Waitangi was signed in the mid nineteenth century. Russell was declared the nation's original Capital and this is when the questionable British colony was set up. There are many Māoris who still do not approve even up to present times. 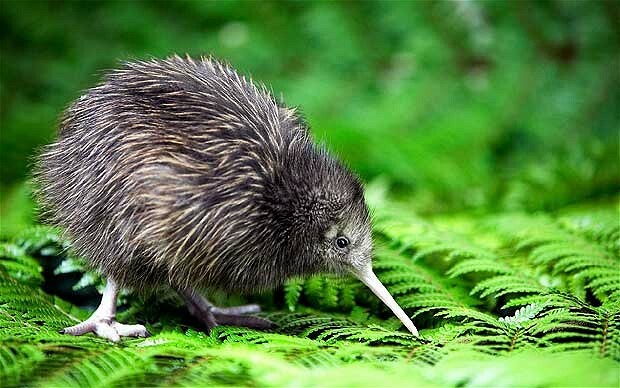 The endangered spotted kiwi bird, the national emblem no less, can be seen here on Moturua which is a sanctuary. A Māori village is viewable right on top of the island so this is a great walk for history buffs. It was said to have been destroyed by the French in the late eighteenth century after the locals killed and ate Marion du Fresne. This was their way of fighting back after the French encroached on this sacred land. The Bay of Islands Marine Park is absolutely stunning to look at and is a place where dolphins come to play. However, there is an element of danger too since this place houses the red backed spider, which attacked unwary people on the beach. Orcas have been seen in the bays too so this must be a haven for wildlife enthusiasts. Indeed, there are so many bays and promontories it may be a good idea to get the lay of the land in a short air tour. 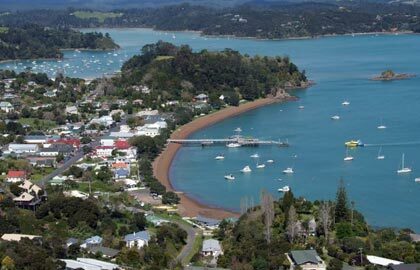 There are several little towns scattered along the Bay of Islands coastline with the commercial centre being Paihia. 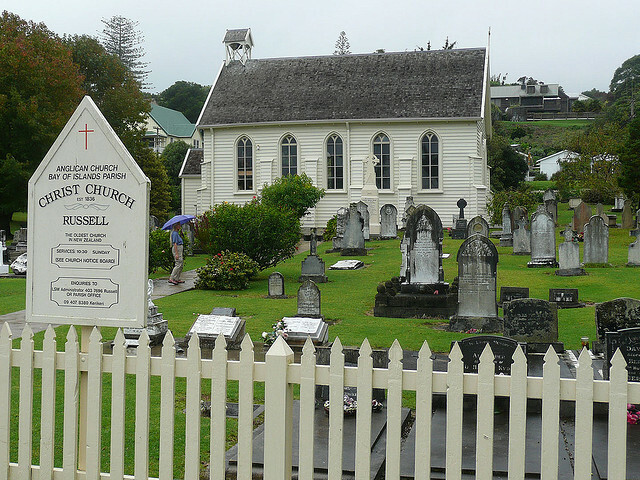 Kerikeri is a lovely little place on the mouth of the inlet and also holds some history since it was the second Mission set up by Samuel Marsden in the early part of the nineteenth century. Imagine, he bought the land from the local chief for just forty eight axes! There are kiwi and citrus groves here to explore along with the oldest building in the region, the Mission House, which was completed in 1821. 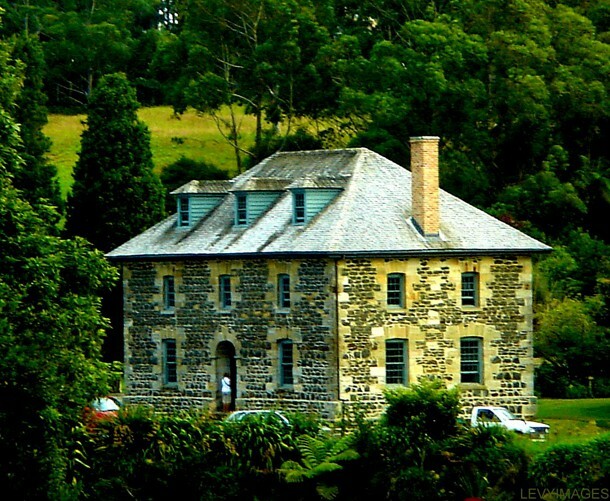 The Stone Store at Kerikeri is New Zealand's oldest stone building (1832). Across the bay is Russell which was the first capital before Auckland. It is just a short ten minute ferry ride and used to be called the 'hellhole of the Pacific' because of the vice that was common in the bawdy and lawless port. The waterfront area still has quaint little wooden houses - that used to house runaway convicts, deserting seamen, prostitutes and grog sellers - but, thanks to progress, the old grogshops have made way for lovely little shops that welcome visitors year round. There is a great museum in the area too which used to be the printing house for religious books with a tannery to produce the leather to bind them. This, and the oldest church in New Zealand, the Anglican Christ Church built in 1836, is well worth the visit if only to see the embroidered hassocks featuring sea shells and ships etc. Look for the bullet holes that were put there in the Flagstaff War in the mid nineteenth century between the British and the local Māori Chief, Hone Heke. It is obvious then that this part of New Zealand will take some time to explore if only for the number of islands situated here. Visitors can intersperse their days with long lazy swims from beautiful beaches to finding out about local history.